Ivan Moody was hospitalized last week in Denver and the band canceled Australian tour with Black Sabbath and two headlining tour in Sydney and Melbourne. Live Nation said in a statement: "Last Thursday, Five Finger Death Punch singer Ivan Moody was hospitalized in his hometown of Denver. He is expected to make a full recovery but it is with deep regret that Five Finger Death Punch will be forced to cancel their appearances in Australia, both with Black Sabbath and as headliners in Sydney and in Melbourne. 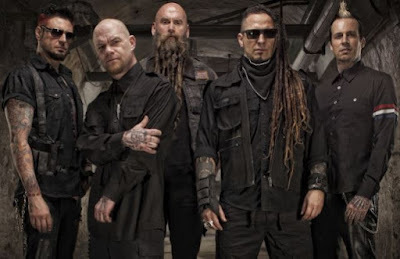 It is especially disappointing to Five Finger Death Punch that they will not be able to play before Black Sabbath, a band Five Finger Death Punch has deep reverence for, on Black Sabbath's last-ever shows in Australia. Ivan and Five Finger Death Punch express their sincere apologies to both their fans and to the fans of Black Sabbath."